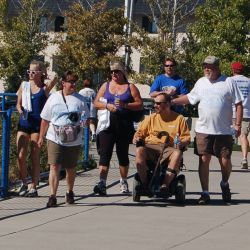 The ALS Association Nevada Chapter is a not-for-profit 501 (c)(3) organization serving people with ALS throughout Nevada. It is our goal to serve all persons and their families living with and fighting ALS in Nevada one person at a time. We work extensively to provide much-needed programs that offer emotional, physical and financial assistance. As a 501(c)(3) organization we depend upon the generosity of individuals, businesses and corporations who provide us with tax-deductible contributions so that we may fulfill this mission and meet the needs of Nevada ALS pALS that we serve. Our chapter is dedicated to providing the best care and service possible to those that have ALS until research efforts lead to the day when we find a cause and cure for Lou Gehrig’s disease. With your help, our mission will continue and we will be able to better assist those who depend upon us. We actively raise funds in your community to continue our non-profit services. To help the ALS pALS and family to live as full and as normal a life as possible. To aid those living with ALS through the loan of equipment or by other means. To serve as a liaison, linking the ALS pALS and family to available resources and information. To educate and inform the general public as to the nature of ALS. To encourage and support research for the prevention, alleviation, care, treatment and cure of ALS. To increase awareness of ALS in all levels of government in an effort to expand government support of research and elicit programs to make treatments and care accessible and affordable for all people living with ALS.